When a student is enrolled in Jackrabbit using an Enroll button, an Enroll link, or via Quick Registration/Add Family, Jackrabbit provides an opportunity to post the tuition fee for the class enrolled in. This is a convenience feature and is optional. When a student is enrolled, a Post Enrollment Fees window opens allowing the option of posting the class tuition fee and two other fees to the newly enrolled student's family. 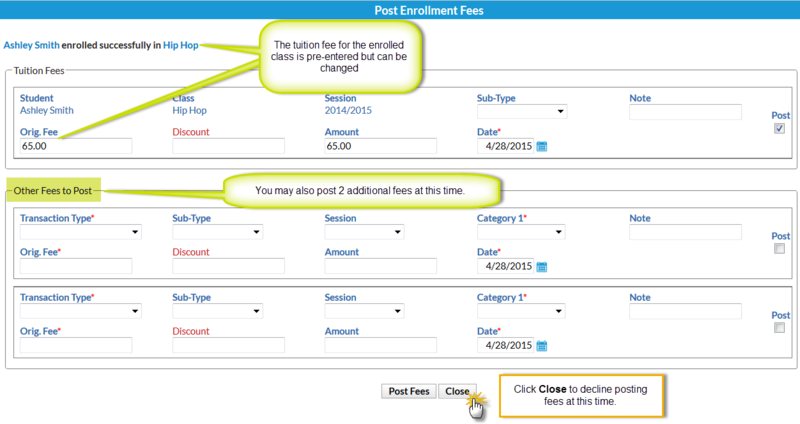 Posting fees at enrollment is optional and can be declined by clicking the Close button. The student is enrolled in the class regardless of whether fees are posted. If an additional fee(s) needs to be posted (registration fee, etc. ), complete the fields in the bottom section and select the Post check box next to the fee to have it included in the posting.